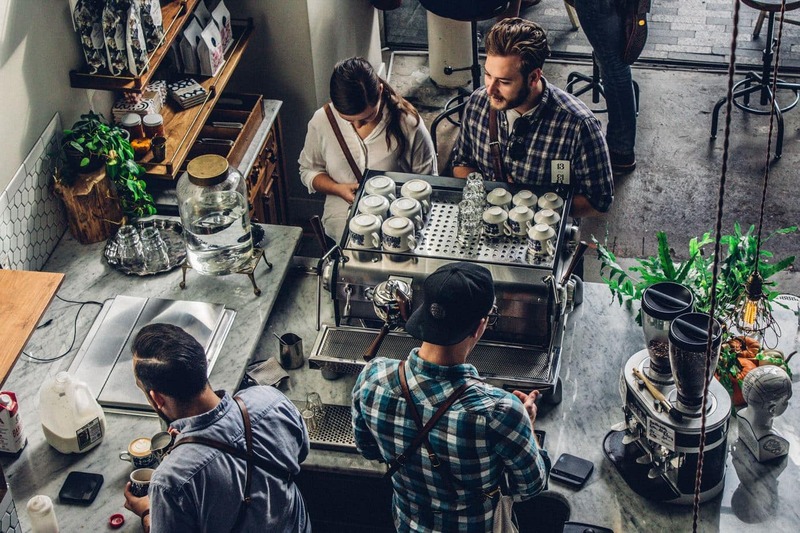 Whether you’re just starting out or you’re trying to grow an already an established business, choosing the right espresso machine for your shop is vital. So if you’re trying to take your commercial brewing to the next level, read on for some reviews of our favorite products. Coffee culture became big in Europe by the 19th century. As a result, inventors, especially in Italy, strove to innovate the machinery associated with the craft. Angelo Moriondo is the man credited with creating the original espresso machine. He used a winning combination of steam, high pressure, and tightly packed grounds to create the foundation for the modern espresso machine. After Moriondo, the modernization continued with Luigi Bezzera and Desiderio Pavoni. 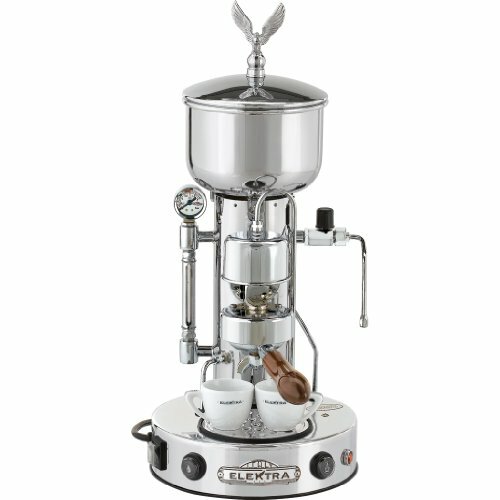 Finally, Achille Gaggia invented spring piston lever, which introduced the world of semi-automatic machines and crema. As innovations progressed, espresso culture did as well. Cafés became popular, the craze spread to the West, and baristas strove to perfect their craft. La Pavoni has been around the commercial espresso scene since 1905. Since then, they’ve become one of the biggest names in the business, and it’s not hard to see why. 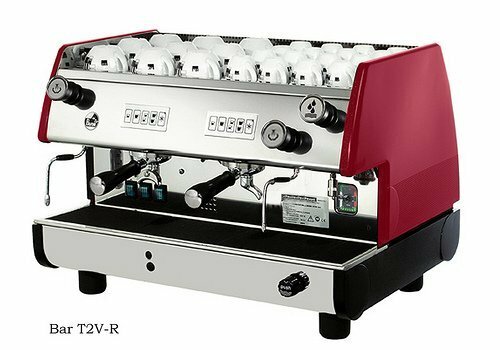 The Bar T 2 is the Mario of commercial espresso machines- good specs all around. With a 14L boiler capacity and the capability to produce 600 cups of espresso per day, this machine is perfect for most coffee shops. If you’re just looking for a quick recommendation, stop at this machine. It’s our overall top pick. If you prefer a manual machine, the more expensive La Pavoni Bar 3L-B If you click this link and make a purchase, we earn a commission at no additional cost to you. might be something worth splurging on. This luxurious semi-automatic machine is NSF certified for commercial use and ready to jazz up any cafe. This machine is best suited for small to mid-volume shops because it is semi-automatic and with one grouphead. However, despiete it’s size, this machine packs a considerable feature-bundle. Even though you’ll have to tamp and grind your own grounds, this machine does have an auto-shut off feature for shot pulling. Also, It has programmable buttons to one cup, two cup, and continuous brews. If you want something without all the bells and whistles, opt for the Nuova Simonelli Oscar II If you click this link and make a purchase, we earn a commission at no additional cost to you. , which still has one of the best steam wands on the market. If you want something a little simpler than the Lux or with two spouts instead of one, opt for the Appia. With the capability to brew between 30 and 100 drinks per hour, the Appia II works well in a medium capacity coffee shop. 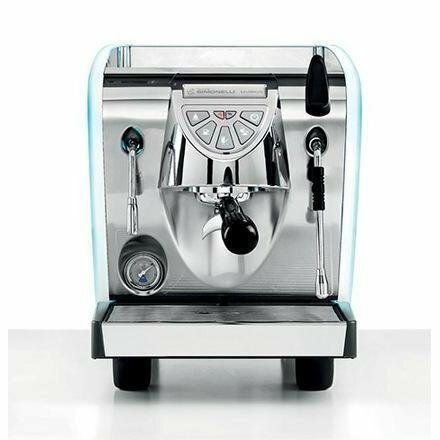 The perfect mid-range machine, the second Appia is one of Nuova Simonelli’s best selling models. It uses volumetric monitoring to stop shot pulling at the exact right time. Even before your shot is pulled, the Appia II uses a pre-infusion function to make sure you get the most from your grounds. Aurelia Digital 4 Group If you click this link and make a purchase, we earn a commission at no additional cost to you. might be worth the investment. Produced by one of the first companies to manufacture super automatic espresso machines, the E61 is a top-notch, classic commercial machine. This machine is a beautiful blend of time-tested usability and forward thinking innovation. The E61 grouphead is often referred to as the industry’s “gold standard.” Also, the joystick-style lever is ergonomic and fun to use. Additionally, the heat exchanger and dual boiler allow for quick a heat-up and cycle as well as simultaneous shot pulling and milk frothing. So while it’s a little on the small side, you can still get a lot out of this machine. The Bezzera Magica is best for smaller cafe’s, but it’ll reliably produce excellent espresso and espresso based drinks for years. If you’re just as concerned with aesthetics as you are with the taste of your espresso, this Microcasa might be the machine for you. The heat exchanger on this machine is commercial grade and the design is honestly stunning. Plus, water can be pushed to refill the group-head with a pump-operated mechanism. 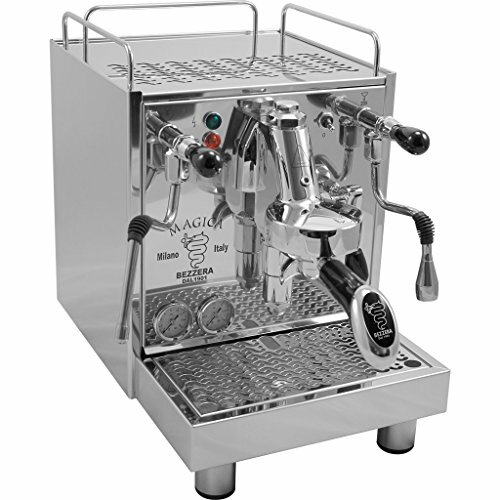 Additionally, if you want to capture the vibe of a classic espresso bar, the semi-automatic style of this machine will help you achieve it. It allows you to fully partake in the performative art of espresso brewing. On the flip side, the semi-automatic-ness means more work for the barista. So if yours isn’t super experienced or if you’re in a larger setting, you might want to look elsewhere. 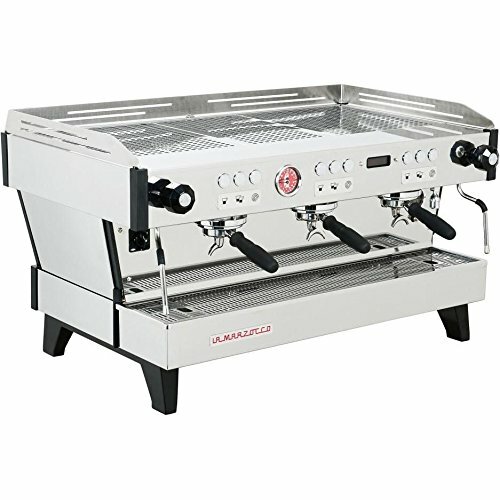 This machine represents the peak of La Marzocco’s design and innovative capabilities. Like all La Marzocco products, the PB features energy saving, insulated double boilers and software that allows for easy programmability. Additionally, this model offers a “stand-by” mode for extra energy efficiency. The price and size are both a bit hefty, making this machine less practical for smaller, newer shops. However, if you can swing the price and have the space, this stainless steel classic will serve you well for years to come. Selecting a machine to suit a commercial setting can be a big deal, so make sure you’ve thought through all the factors before making your choice. Below are some of the main things you need to consider before taking the plunge. You need to consider volume in two senses. First, the volume of your establishment. How many people do you typically serve per day? What does rush hour look like? Whatever your answers are to those questions, you need a machine that can keep up with your needs. Which brings us to the other kind of volume: water. If your machine doesn’t have a direct water line, you’ll need to consider how many shots it can pull before needing to be refilled. A smaller tank won’t bother a smaller shop, but it could quickly become a pain for a larger one. What all can the machine DO? Some machines can just pull a shot and still require a little assistance to do that. Others are decked out in features like auto-frothing, hot water spouts, etc. You want to make sure you get a machine that is versatile and easily customizable. A good way to check versatility is to see if it has presets and if you can alter them with ease. Also, look to see if you can change the temperature and volumetric controls. Speaking of versatility, you’ll need to consider whether to get a semi-automatic or a fully/super-automatic machine. Semi-automatics usually give you more control over the brewing process. Plus, they allow your barista to demonstrate his or her skills. However, if you or your employee(s) aren’t very experiences, a semi-automatic can be challenging to learn. On the other hand, a fully or super automatic machine might be harder to customize. But, it should be easier to learn and it will probably make things a lot more convenient. This might seem like a no-brainer, but it is something you should probably slow down and really think about. Does the machine have a built-in frother or a steam wand? How good is it if the machine has one? Sometimes, you will need to purchase extra equipment to complete your commercial arsenal. So even if you save on the machine itself, you might have to blow the money on other accessories. Thus, you should check what a machine offers against everything you need to see if there are any gaps you’ll need to cover separately. La Pavoni, founded in 1905, is an Italian manufacturer of both domestic and commercial products. This brand developed right alongside the Bezzera brand and the two are known for being two of the first names in commercial espresso. They are widely known for incorporating classic designs with high quality builds to produce unique, durable machines. 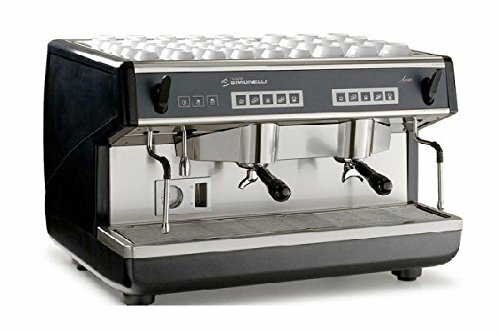 A dominating force in both accessible and luxury products (since the absorption of Victoria Arduino), Nuova Simonelli has been a leading brand in commercial espresso machines since 1936. Their products are commercial grade and lend themselves well to coffee shops and home use. You might recognize this name as that of one of the first to have an espresso machine patent. Bezzera was founded in 1901 and has been one of the leading names in the game since they basically began the game. They produce both professional and semi-professional machines. And their main focus is on the research and development of new innovations for their products. This Italian manufacturing company was founded in 1947 and puts their focus on the artistic side of espresso brewing. They are one of the few companies that has refused to produce any automatic machines, specializing exclusively in manual and semi-automatics. This company, named after the Florentine lion, has been around since 1925. La Marzocco is responsible for a large amount of innovative moves in the realm of commercial espresso, including the double boiler, saturated grouphead, PID controllers, and fully programmable pressure profiling. Additionally, this company is active in pursuing sustainability, which you can read a little more about here. What makes commercial machines different from domestic ones? While there are obviously variations that depend on brand and build quality, there are a couple of consistent differences between commercial and domestic machines. First, commercial machines can generally handle higher volume environments. The number of drinks that can be brewed per day and the speed at which those shots are pulled consecutively tends to be higher for commercial machines. Second, the level of programmability for commercial machines, regardles of their automation level. Thus, commercial machines can make more precisely tuned specialty drinks (that is, of course, if the barista knows how to adjust these settings). Lastly, commercial machines are generally much larger and heavier than domestic machines. So even though some domestic machines may be able to handle low-volume shops, chances are most commercial machines wouldn’t work well on your countertop. These extra features also account for the higher cost of commercial machines. What machines does Starbucks use? The famous coffee giant gets their espresso machines from a Swiss company called Thermoplan. The model is called the Mastrena High Performance Espresso Machine. It’s a fully automatic bean to cup machine. They opted for this capability above manual or semi-automatics to streamline their service. However, they still have baristas who can program and interact with the machinery to give customers the cafe experience. Unfortunately, Thermoplan works exclusively with Starbucks, so other companies are unable to get the same machines. On the bright side, other high-end fully automatic espresso machines listed above can achieve similar results. A café is a café, no matter how small. So, regardless of what your commercial establishment looks like, you should be able to find the perfect machine for you. Semi-Automatic vs Automatic Espresso Machine: Who’s Pulling the Shots? In the world of modern brewing, it can be difficult to figure out which machine is going to suit your espresso needs. In this article we compared semi-automatic vs automatic machines to help you decide between these two dominating brewing methods.